The online world of business is undeniably changing. But, have we seen its full extent yet? Perhaps the answer lies with the blockchain technology. Some studies point out that with blockchain (like Ripple, and of course, other similar ones like Stellar or the ones that might come to the party) integration by the banks, they will be able to realize significant savings. The banks will enjoy cost reductions not only in their payment processing as well as reconciliation alongside compliance and treasury operations. DZ Bank is one of the most talked after bank in Germany. It is the second largest bank in the country by asset size as well as the central institution. The bank functions as both a central institution as well as corporate and investment bank. 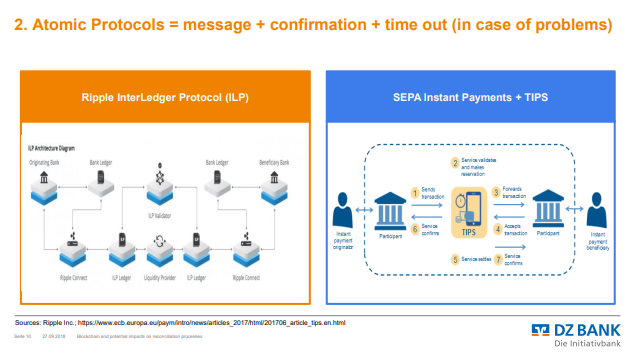 Concerning potential Ripple Interledger protocol integration, the bank has listed a couple of slides in their recent report “blockchain(s) and potential impacts on reconciliation.” It is not rocket science to what that may mean just because the protocol is all about cross-border transactions.